This is a highly unusual 3 level interchange at ordinary city streets. At ground level is Holmes Road with parallel railroad tracks. The first overpass is Almeda Road, which was constructed in the mid 1980's. Almeda also has parallel railroad tracks, which are in the foreground. The upper level is Bellfort road, which was completed in late 2000. Photo taken December 22, 2000, looking north. 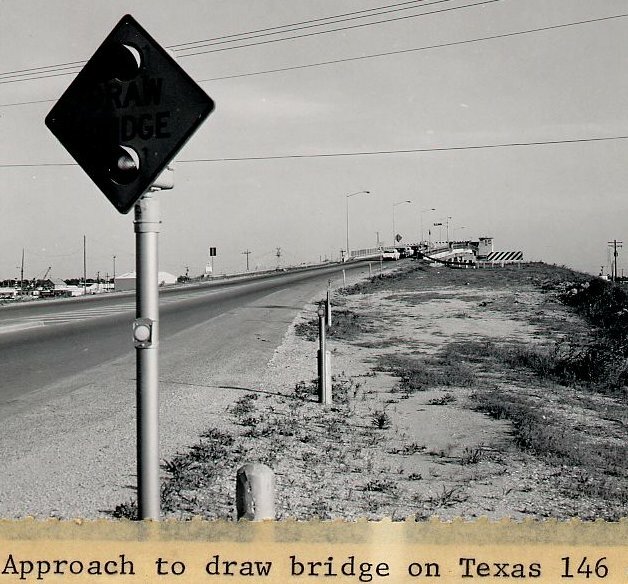 "(before the Almeda Road overpass was constructed), Almeda Road (FM 521) was trenched, and Holmes Road had an overpass at ground level. The overpass was damaged around the late 1970s, and during this time, Holmes Road was impassible." 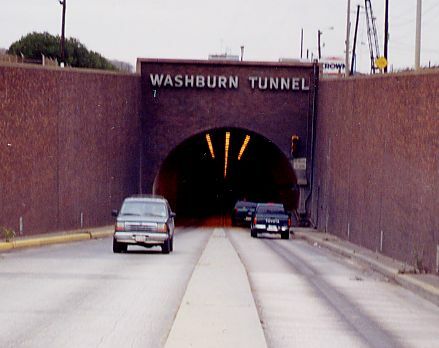 Houston's only remaining vehicular tunnel is the Washburn Tunnel. (The Baytown tunnel was removed after completion of the 146 bridge.) It was completed in 1950. For more information on this tunnel, check out Colin's tunnel history. Houston is as flat as a billiard table, so all freeways depressed below grade require pump stations. 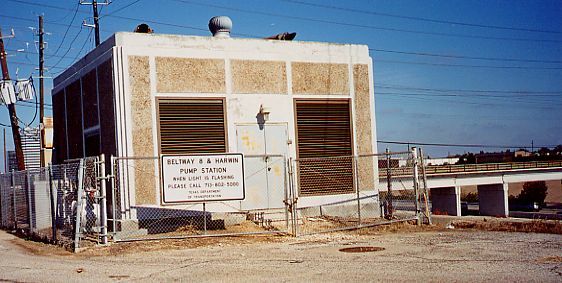 This is the pump station at Beltway 8 and Harwin, which will soon be the location of the Westpark Tollway. 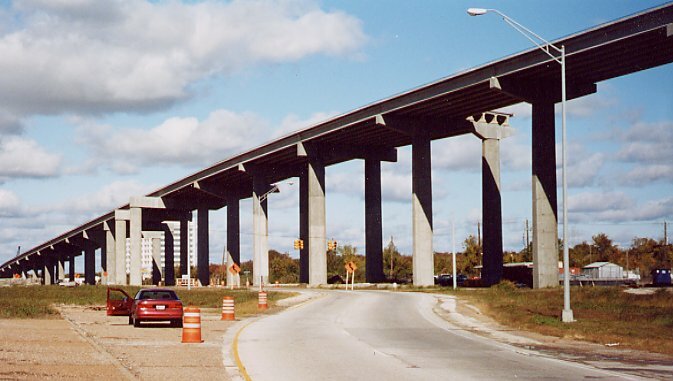 Any place in Houston where a freeway or road dips below grade, you will find one of these structures. The 146 bridge over the channel between Galveston Bay and Clear Lake at Kemah, TX. Before this bridge was constructed around 1985, a drawbridge existed here. (See photo below.) This was the scene of massive traffic jams in the summer when bridge openings were frequent due to large fleets of pleasure craft passing through the channel. Photo taken November, 2000, looking north. This is a 1968 view of the drawbridge that existed at the Clear Lake Channel. Interstate 10 just inside Loop 610 near Washington Street. This section of IH-10 is 10 lanes wide, is depressed below grade, and was completed in the late 1960's. Full replacement of the concrete pavement was completed in 1999. Photo taken summer 2000, looking east. Interstate 45 in north Houston, just north of Beltway 8. This freeway was originally constructed in the 1960's. Major reconstruction and widening was completed in 1998. Photo taken summer 2000, looking north. Interstate 45 north of Beltway 8 has 10 general purpose lanes and a central HOV lane. Freeway reconstruction and widening was completed in 1998. Photo taken summer 2000, looking north. This is the new ramp from northbound 146 to eastbound 330. When this photo was taken in late November 2000, the ramp was nearly complete. Photo taken November 2000, looking northeast.